Nitric acid 68% is light clear-yellow colour liquid, highly corrosive and excellent oxidising/reducing agent. Order nitric acid online in bulk to get it at the discounted price. SKU: NA. Categories: Raw Chemicals, Specials of the Month. 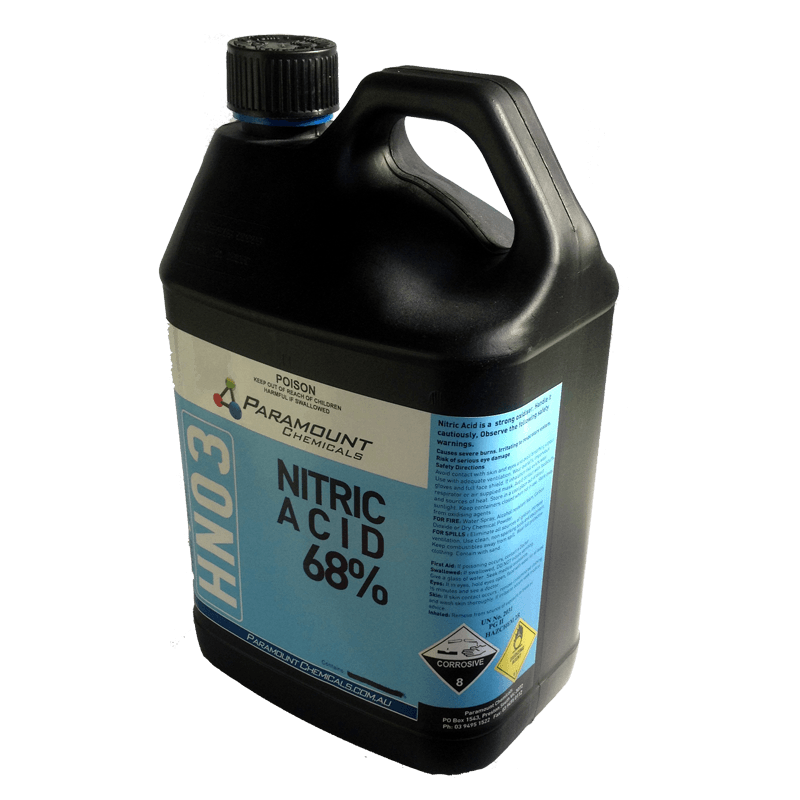 Tags: buy nitric acid, nitric acid, nitric acid for sale, nitric acid online, paramount chemicals. Nitric acid 68% is light clear-yellow colour liquid, highly corrosive and excellent oxidising/reducing agent. Both these properties are exploited in variety of different industries; It should be handled very carefully. At concentration > 95% nitric acid is also known as white fuming nitric acid. Fumes are toxic. Largely it is used in fertilizer industry to produce ammonium nitrate. It is in integral part of Aqua regia solution; used in gold refining, recovery and extraction process. Due to high corrosive nature it is used as pickling agent for metals- to remove any rust, scale, inorganic impurities from ferrous metals as well as copper and aluminium alloys. It is used in electroplating industry to strip nickel and chrome. Paramount chemicals are one of the top nitric acid suppliers of Victoria, Australia. Buy nitric acid online in bulk to get it at the discounted rates now at Paramount chemicals.